Yasui Senchi Senkaku (安井仙知仙角, Sakaguchi Senchi, O-Senchi, 1764-1837) was a Japanese, Jun-Meijin (8-dan) professional from the Edo era. He became the seventh head of the Yasui house from 1780-1814. He is famous for his central influence style and has been called the Grandfather of Modern Go & O-Senchi (大仙知, meaning Great Senchi). He's the son of Sakaguchi Sentoku I.
Sakaguchi Senchi was born in 1764 into the Sakaguchi minor house, which was closely allied with the Yasui house. Thus, when Senchi demonstrated great talent, he was sent to the Yasui house to be taught by stronger players. His talent was so great that the Yasui's, certain that they had a genuine genius on their hands, appointed Senchi as heir when he was only 2-dan. No sooner had Senchi been appointed Yasui Sentetsu passed away making Senchi the seventh head of the Yasui house. Faith has been well placed as Senchi was promoted all the way to 6-dan within six years -- an exceptional rate at the time. In 1801, Senchi received his promotion to Jun-Meijin along side Honinbo Retsugen. But even though he and Retsugen shared the same rank, there was little doubt of Senchi's superior skill. Before Retsugen passed away, he held a score of thirteen losses and two wins to Senchi. Senchi was the strongest player of his day and considered of Meijin strength; however, he never applied for the post appearing to be content with his position in life. In 1814, he retired as head of the Yasui house, handing it over to his heir (Yasui Chitoku Senkaku), and proceeded to devote the rest of his days to training the Sakaguchi heir, Sakaguchi Sentoku II. O-Senchi passed away in 1837. Senchi's style was notably different from the other players of his day, leading to one description of his play as "switching between the orthodox and unorthodox in fathomless ways" (奇正変幻不可端倪). He often began from the 4-5 and 3-5 points, played on the fourth and fifth lines, emphasized the center, and enjoyed building large center moyos. Go Seigen and Kitani Minoru had both been familiar with Senchi's style of play when developing their New Fuseki, and Kitani was known to regularly visit Senchi's grave to pay his respects. As such, Senchi has been esteemed as the Grandfather of Modern Go. His nickname O-Senchi is sometimes used to distinguish him from his heir, Yasui Chitoku, who also went by Senchi for a period. 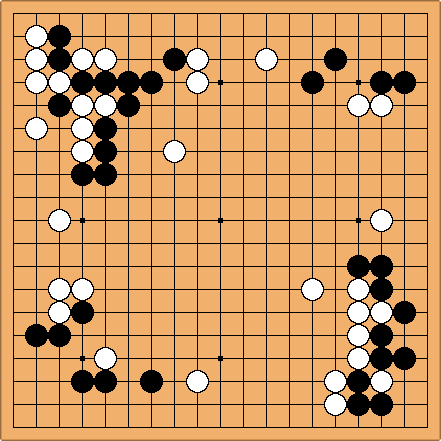 400 Years of Go in Japan, pps. 55-6. Honinbo Shuwa was known to have held O-Senchi in this high esteem. Some historians suspect that Sakaguchi Sentoku II may have been his son. From GoGoD's player biography of O-Senchi.